On this vote the yeas are 50, the nays are 50. The Senate being equally divided, the Vice President votes in the affirmative and the nomination is confirmed. Under parliamentary law, a motion is lost if there is a tie vote (or less than two-thirds if that is the required vote). To maintain the impartiality of the chair, the presiding officer normally votes only to make or break a tie vote. If there is a tie vote, and the chair is indifferent, or wishes for the motion to be lost, he or she can choose not to vote. Since such an abstention does not disclose the chair's position, if any, on the question, the anyonymity protects the impartiality of the chair. Alternatively, if a two-thirds vote is required, the chair can vote in the affirmative to make a two-thirds vote, or can vote in the negative to lose a two-thirds vote. Also notice, in the video clip, that after the result of the confirmation vote was declared, the Senate Majority Leader, after obtaining the floor, immediately made an original main motion to Reconsider the vote, which can only be made by a member of the prevailing side. He then followed this by a subsidiary motion to Table the motion to Reconsider the confirmation vote, which was carried. Finally, he asked for unanimous consent to waive the mandatory quorum call, which is an incidental main motion to Suspend the Rules, requiring a two-thirds vote under general parliamentary law. The chair confirmed unanimous consent by saying "Without objection." This means that opposition to the motion, if any, had acquiesced, since a single objection would have compelled a vote. However, this could have been viewed as dilatory, potentially making the opposition look bad. The motion to Table, under the procedural rules of the U.S. Senate, is different than the motion to Lay on the Table under general parliamentary law. In the former case, the motion to Table has the same effect as Postpone Indefinitely under general parliamentary law, which is to kill the motion. Why did the Senate Majority Leader move to Reconsider, then to Table that motion? By killing the motion to Reconsider the vote on the confirmation, it prevented that reconsideration from again being moved by a member who voted in the affirmative. By making this motion as soon as possible after the confirmation was declared, it minimized time for contemplation of the motion to Reconsider, thereby making it easier for the motion to be tabled by a majority vote. Why did the Senate Majority Leader ask for unanimous consent to waive the mandatory quorum call? In theory, it is possible that enough opposition members could have exited in time for the assembly to lose its quorum, and possibly jeopardize the validity of the confirmation vote. Given the sustained opposition to the confirmation, nothing would be out of the question. Therefore, by making this motion immediately after the confirmation vote, it would minimize the time available for senators to make an exit. In any case, the series of three motions made by the Senate Majority Leader can be seen as a formality to make it clear for the record that the confirmation was unequivocal. The 57th Annual Convention of the Association of Hawaiian Civic Clubs (AHCC) was held from November 13th through 20th, 2016, at the Plaza Hotel and Casino in Las Vegas, Nevada. On Saturday, November 19th, 2016, at the end of the final plenary meeting, under new business, two points of order were raised regarding AHCC Resolution 14-28 adopted at the 2014 Convention of the Association. The basis for these points of order relate to how Resolution 14-28 was subsequently rescinded unilaterally by the AHCC Board of Directors between annual conventions. In addition to being rescinded in this manner, Resolution 14-28 was also expunged from both the verbatim minutes of the 2014 Convention, and from the PDF document available on the AHCC website, which contains the programmatic resolutions from the 2014 Convention. Transcript of the two points of order are provided below in bold, along with references and commentary. The chair (Pelekikena Annelle Amaral) ruled that the points of order were not well taken. As a tactical strategy, the ruling of the chair on the first point of order was not appealed. This way, the second point of order could be raised before the chair would be more likely to call for the sergeant-at-arms to compel the delegate to yield the floor. The ruling of the chair on the second point of order was appealed. The appeal was debatable, since the question did not involve decorum, rules of debate, or the priority of business. See Robert’s Rules of Order Newly Revised (RONR), 11th ed., p. 398, ll. 20-27. However, the chair went directly to a vote without asking if anyone wanted to speak in debate on the appeal. Furthermore, the chair used incorrect form by pointing at the delegate and personalizing the question. "All those who agree with his point of order..." See RONR (11th ed.) pp. 259-260. The assembly sustained the ruling of the chair. DELEGATE: E ka Pelekikena. 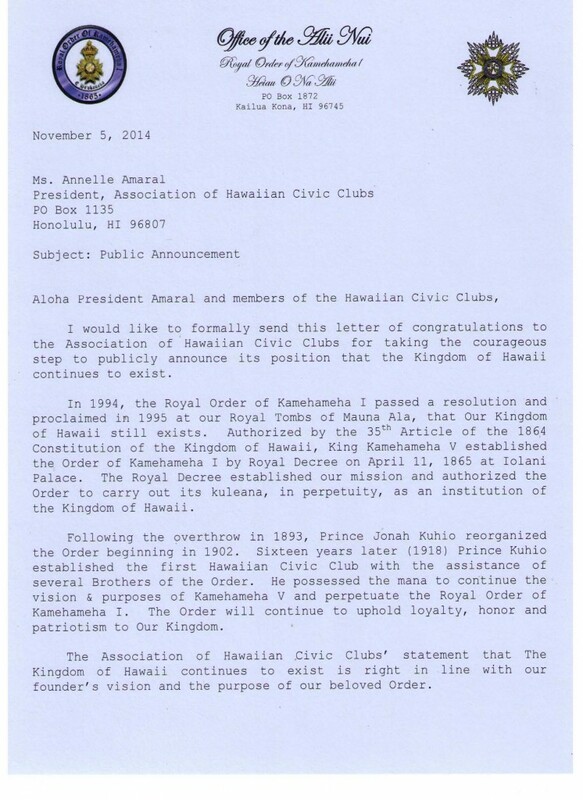 Keokani Marciel, Delegate, Ka Lei Maile Aliʻi Hawaiian Civic Club. Manaʻo Hoʻomalu. I rise to a point of order. I make the point of order that the action taken by the Association Board of Directors between the 2014 and 2015 conventions, to rescind Resolution 14-28 (Acknowledging the Continuity of the Hawaiian Kingdom as an Independent and Sovereign State) and expunge it from the record, is null and void because it is in violation of the current bylaws of the Association (amended October 2011), in Article III, Section 1, lettered paragraph g, which states that the Board cannot take an action or position that is “in conflict with actions taken by the annual Convention.” Only delegates assembled at an annual Convention can rescind resolutions previously adopted at an annual Convention. For reference, please see the 11th edition of Robert’s Rules of Order Newly Revised (RONR), pages 483 and 577. If desired, I can read the reference. The duties of the Board of Directors are as follows: ... g. To take appropriate actions and positions unanticipated by and not in conflict with actions taken by the annual Convention. In any event, no action of the board can alter or conflict with any decision made by the assembly of the society, and any such action of the board is null and void. A board may never alter a decision of the society’s assembly ... , even by a motion to Rescind or Amend Something Previously Adopted or by adoption of a proposal which has been rejected, unless expressly authorized by the superior body or by the bylaws (see p. 483, ll. 6-13). The membership is the superior body to the Board of Directors. The membership delegates powers to the Board through provisions in the constitution and bylaws of the Association. Thus, the Board derives its power from the membership, and not the other way around. The Board can only receive authorization from the membership through delegates assembled at an annual Convention. In the case of Resolution 14-28, the 2015 Convention would have been the first possible time at which the Board could have received such authorization. However, the Board action happened after the 2014 Convention and prior to the 2015 Convention. Furthermore, even if the Board waited until the 2015 Convention and received authorization from the assembly of delegates, the Board action would still be null and void since it conflicts no less with the Association bylaws, in Article III, Section 1, g. In fact, the authorization itself would be null and void because of that same conflict with the bylaws. ​DELEGATE: E ka Pelekikena. Manaʻo Hoʻomalu. I rise to a point of order. I make the point of order that the action taken by the Association Board of Directors between the 2014 and 2015 conventions, to rescind and expunge Resolution 14-28 from the record, is null and void because it is a motion that requires an affirmative vote by a majority of the entire membership, which in this case would be the delegates registered at an annual Convention. Therefore, even if the Board of Directors unanimously approved the motion to rescind Resolution 14-28 and expunge it from the record, the decision clearly would not constitute a majority of the entire membership. For reference, please see the 11th edition of Robert’s Rules of Order Newly Revised (RONR), pages 310 and 404. If desired, I can read the reference. On extremely rare occasions when it is desired not only to rescind action but also to express the strongest disapproval, a member may move to Rescind and Expunge from the Minutes (or Record). Adoption of this motion requires an affirmative vote of a majority of the entire membership, and may be inadvisable unless the support is even greater. Even a unanimous vote at a meeting is insufficient if that vote is not a majority of the entire membership. In a convention of delegates a majority of the entire membership means a majority of the total number of convention members entitled to vote as set forth in the official roll of voting members of the convention. ​It was not too late to raise the above points of order, because unlike a rule of order which must be addressed promptly at the time it is breached, the Board action to rescind Resolution 14-28 and expunge it from the record is of a continuing nature for two reasons. First, it conflicts with the bylaws (amended October 2011, Article III, Section 1, lettered paragraph g). Secondly, the action was taken in violation of a fundamental principle of parliamentary law. Namely, the board can never alter a decision of the assembly. In this case, the board unilaterally altered a decision of the delegates assembled at the 2014 Convention. See RONR (11th ed.) p. 251, ll. 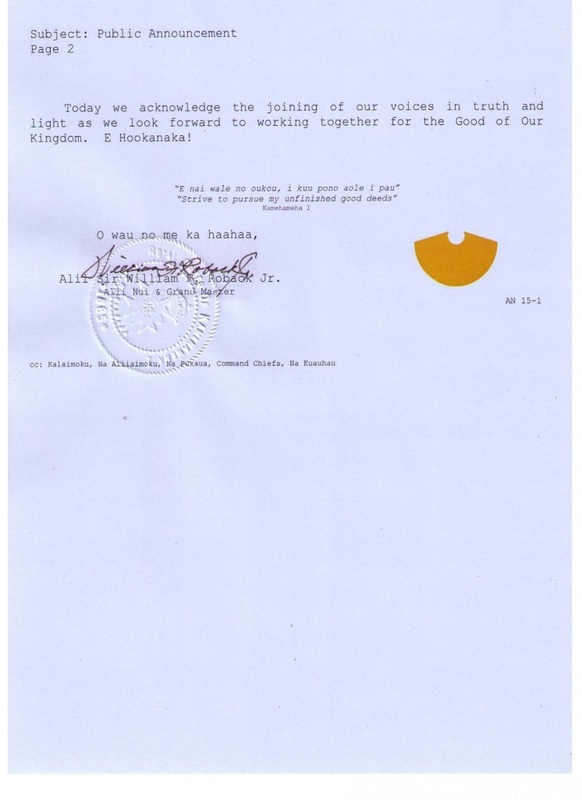 3-26, with particular attention to lettered subparagraphs a and d.
​Motions that conflict with the corporate charter, constitution, or bylaws of a society, or with procedural rules prescribed by national, state, or local laws, are out of order, and if any motion of this kind is adopted, it is null and void. The Association bylaws provide no exception to the rule that the Board cannot take actions and positions in conflict with decisions made by an annual Convention. If, for example, the intent of Resolution 14-28 came into question by the Board after the 2014 Convention, the Board has no authority delegated to it from the bylaws to unilaterally rescind (or rescind and expunge from the record) the resolution based on a changed understanding of the intent. If there was a question about the intent of the resolution, it should have been addressed by delegates during the annual Convention at which Resolution 14-28 was adopted, or at a subsequent annual Convention. It should not have been acted upon unilaterally through a Board meeting held between annual conventions. Under parliamentary law, the constitution and bylaws of a society cannot be suspended (RONR, 11th ed., §25), unless a provision is in the nature of a special rule of order, or provides for its own suspension. See RONR (11th ed. ), pp. 13, 17, and 88. Neither exception applies to Article III, Section 1, g, of the AHCC bylaws. Motions that conflict with the governing documents are out of order, and null and void if adopted. In such a case, it is never too late to raise a point of order to reverse the action. See RONR (11th ed. ), pp. 111, 251, and 343. ​The chair must rule on a point of order (RONR, 11th ed., §23). Any two members can appeal the chair's decision, which then goes before the assembly to decide (RONR, 11th ed., §24). This is why it's important for the membership to be familiar with the rules adopted by the society. Parliamentary law is a system of checks and balances that allows for democratic decision-making instead of authoritarian rule, insofar as members assume responsibility for enforcing the adopted rules. 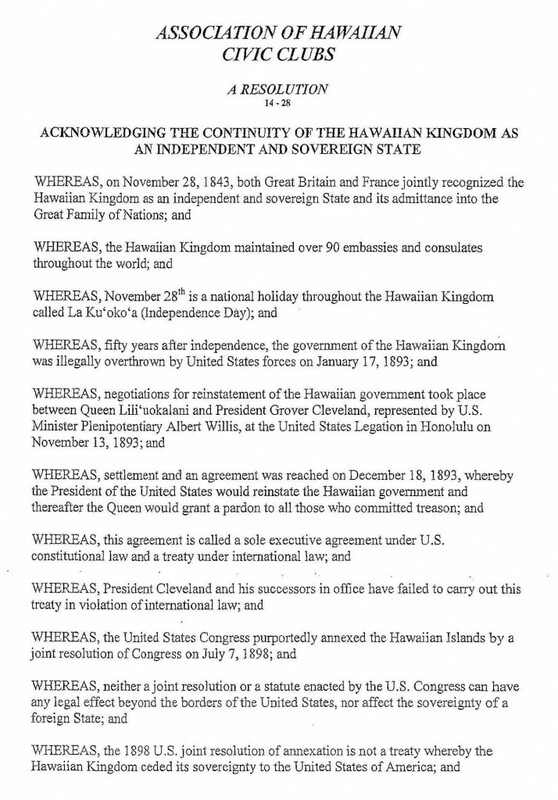 Hypothetically, if Resolution 14-28 was ruled null and void by the assembly of delegates (through a point of order) during an annual Convention, on the basis that it conflicts with a motion previously adopted, such as Resolution 13-35 (Urging the Association of Hawaiian Civic Clubs to Organize, Plan and Execute and/or Participate in a Constitutional Convention to Realize a Native Hawaiian Self-Governing Entity), the vote on Resolution 14-28 would have to have been lost rather than adopted. However, this would preclude a null and void ruling by the chair in the first place. ... motions are out of order if they conflict with a motion that has been adopted by the society and has been neither rescinded, nor reconsidered and rejected after adoption. Such conflicting motions, if adopted, are null and void unless adopted by the vote required to rescind or amend the motion previously adopted. 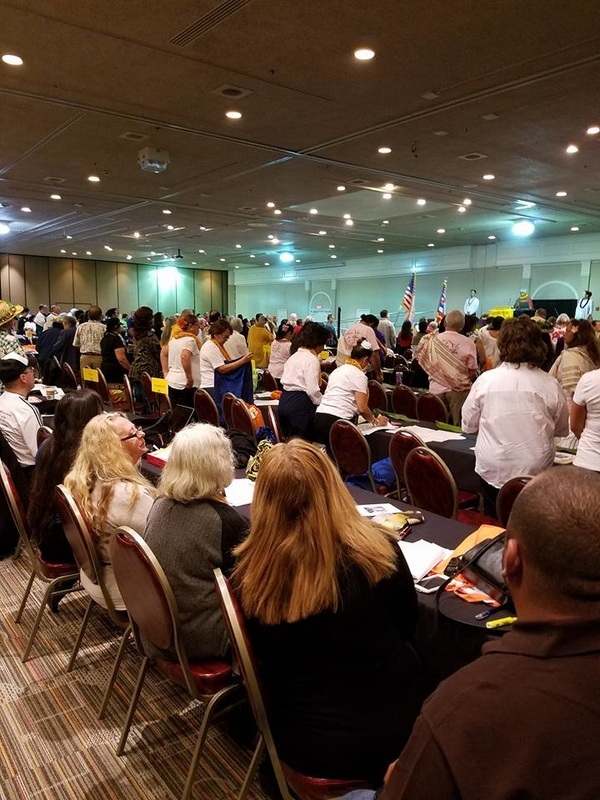 To actually rescind a Convention resolution previously adopted would require adoption of a motion to rescind by the delegates assembled at an annual Convention. To go one step further, and also expunge the resolution from the record, would require an affirmative vote by a majority of all delegates registered in attendance at the convention, not just those assembled and actually voting during a particular plenary meeting. Therefore, even if the 14 members of the Board unanimously approved the motion to rescind Resolution 14-28 and expunge it from the record, the decision clearly would not constitute a majority of the entire membership, whose delegates number in the hundreds at each annual Convention. See RONR (11th ed. ), pp. 310 and 404. Moreover, the action of rescinding and expunging from the record must be done by the secretary in the presence of the assembly. In the case of AHCC, this would have to be the assembly of delegates at the annual Convention. The fact that this didn't happen constitutes a violation of the parliamentary authority adopted by AHCC, and therefore, general parliamentary law that it codifies. Finally, if there is no record of the motion being adopted, in the minutes of the Board meeting where the decision was made, then the Board action would be null and void on that basis alone. If the Board were to decline to provide those minutes to a member upon request, a vote by a majority of all registered delegates (without notice), or by a majority of assembled delegates (with notice), at an annual Convention, would obligate the Board to produce the minutes and read them to the assembly. See RONR (11th ed. ), p. 487, ll. 13-20. It should be noted that the words, "NULL AND VOID", printed in red capital letters superimposed on the title of Resolution 14-28 in the AHCC 2014 Final Resolutions MATRIX, are incorrect. The action taken by the Board was to rescind and expunge Resolution 14-28 from the record (so the correct wording would be, "rescinded and ordered expunged"). It was not a ruling of null and void by the chair in response to a point of order made during a properly called meeting of the annual Convention or of the Board. Even if it was, hypothetically, the ruling would be invalid for the reasons explained in the above analyis. Such a ruling should appropriately be appealed at the time it is made, and the appeal would be debatable. Otherwise, it would never be too late to make a point of order, followed by an appeal if necessary, to reverse such a ruling. In any case, if such a point of order was referred by the chair to the judgment of the assembly, it would be debatable to the same extent as any subsequent appeal. It is a fundamental principle of general parliamentary law that material expunged should be crossed out and still readable, rather than deleted. 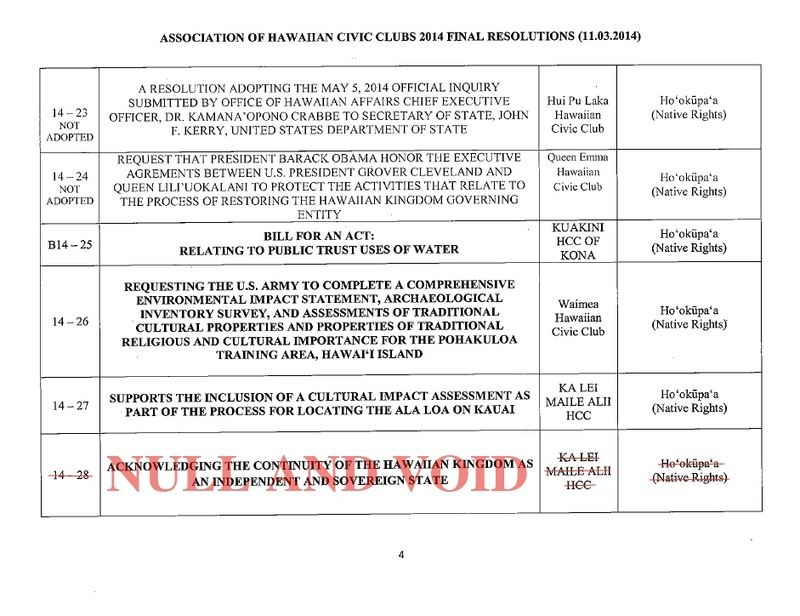 However, Resolution 14-28 was deleted from the record, except for the crossed out title that still appears in the published matrix for the 2014 AHCC programmatic resolutions. 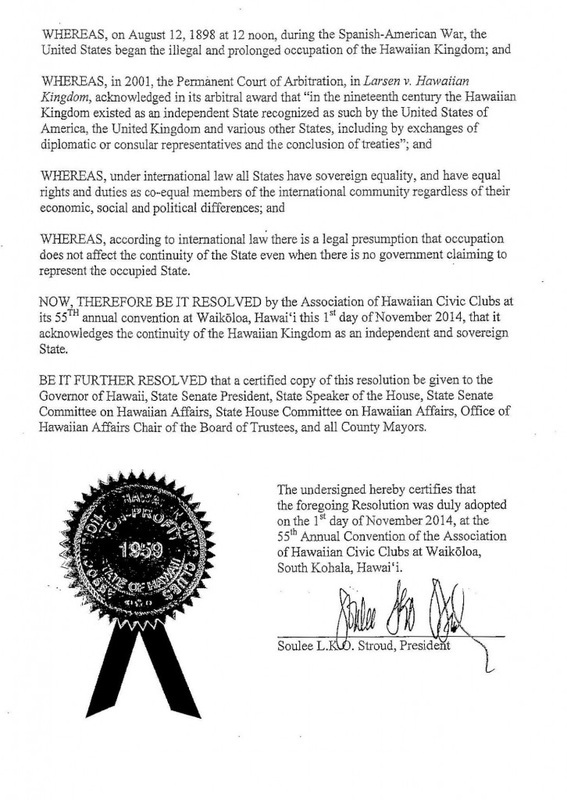 Aside from the infamous Board action, to rescind and expunge Resolution 14-28, being illegal under paliamentary law, it also committed censorship of free speech adopted by a majority of delegates assembled at the 2014 Convention of the Association of Hawaiian Civic Clubs (AHCC). ​At the 2015 Convention, the Board introduced Resolution 15-21, a copycat version of Resolution 14-28—​as though this would somehow absolve the Board of its action, to rescind and expunge Resolution 14-28 from the record, which remains in conflict with the bylaws and parliamentary authority. It is also a contradiction, because if the Board had a valid basis for rescinding and expunging the 2014 resolution, then by extension, the 2015 copycat resolution should also be expunged from the record on that same basis. What is applied to one, should be applied to both, to be consistent. Needless to say, Resolution 15-21 does not rectify the action by the Board, and has no bearing on the status of Resolution 14-28. Resolution 15-21 was not a motion to rescind Resolution 14-28 and expunge it from the record, nor was Resolution 15-21 adopted. Since it was not adopted, it carries no motion having any effect on Resolution 14-28. The Board motion to rescind Resolution 14-28, and expunge it from the record, remains null and void under parliamentary law. Resolution 15-21 is smoke and mirrors contrived by the Board as a cover-up. The aforementioned points of order regarding the legality of the Board action to rescind AHCC Resolution 14-28 and expunge it from the record, could be renewed at a future Board meeting or annual Convention. Alternatively, a main motion could be made at a Board meeting or annual Convention to reinstate Resolution 14-28 or reverse the previous Board action to (illegally) rescind and expunge the resolution from the record (including the verbatim minutes). Resolutions adopted at the annual Convention originate from the assembly of delegates, and not from the Board of Directors. Furthermore, there is no provision in the AHCC bylaws that places under the control of the Board of Directors, the adoption and rescinding of resolutions at the annual Convention. Therefore, it is within the control of the delegates assembled at an annual Convention to rescind the previous Board action to unilaterally rescind Resolution 14-28 and expunge it from the record. The resolution originated from the delegates assembled at the 2014 Convention, and not from a Board meeting. Except in matters placed by the bylaws exclusively under the control of the board, the society’s assembly can give the board instructions which it must carry out, and can rescind or amend any action of the board if it is not too late. 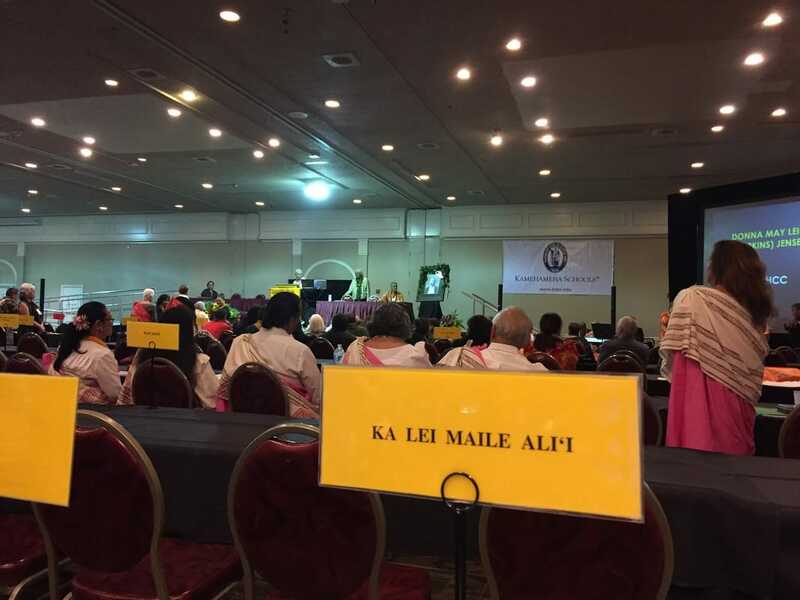 A majority of delegates at the 2016 AHCC Convention demonstrated an unwillingness to challenge questionable actions taken by the Board of Directors, and the current Pelekikena (President) in particular. This was underscored by the re-election of the Pelekikena at the 2016 Convention. Thus, during the next two years, the odds are presumably not in favor of reversing the unilateral action taken by the Board in 2015 to rescind Resolution 14-28 and expunge it from the record, contrary to the bylaws and adopted parliamentary authority (RONR, 11th ed.). However, previous notice of a point of order or motion to reverse the Board action may result in a different outcome by allowing the assembly to have ample time to consider the issue in advance. An alternative of last resort would be to challenge the questionable action through a lawsuit, in an effort to bring the AHCC in compliance with its adopted rules pertaining to Resolution 14-28. Since AHCC is a voluntary association, members may opt to resign, or clubs may opt to withdraw, if unhappy that the violation is not properly resolved.